At the end of the day, this movie only has one reminder for all of us, which I understood from an Internet commenter's interpretation, and that is not to wake up early. Recently, we have reviewed movies that are awesome and completely worth your time, with two of those flicks being nominees for the Academy Award for Best Picture. This time, however, we will be reviewing another "okay" movie, but it is overly disappointing in terms of potential fulfillment. When I first saw the trailer for this future, I was slightly hyped, as it was to be directed by the one who headed the biographical movie The Imitation Game, starring Benedict Cumberbatch as Alan Turing, which is one of my most favorite movies ever. The addition of Jon Spaihts as a screenwriter somewhat piqued my interest for his knack for intriguing concepts, as proven in Alien: Engineers. But sadly, it did not meet most of my expectations. 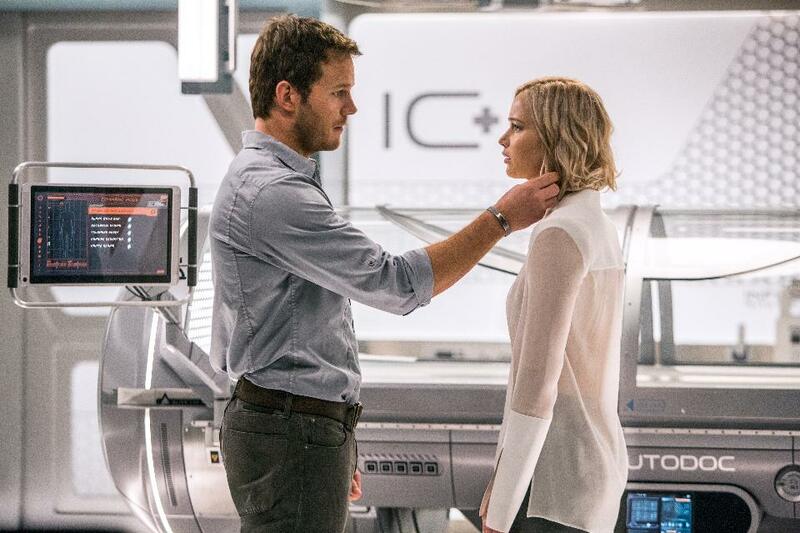 In Dateline Movies' latest spoiler-filled movie review, we tackle the latest film about star-crossed lovers with a science fictional twist, starring Jennifer Lawrence and Chris Pratt, Passengers! 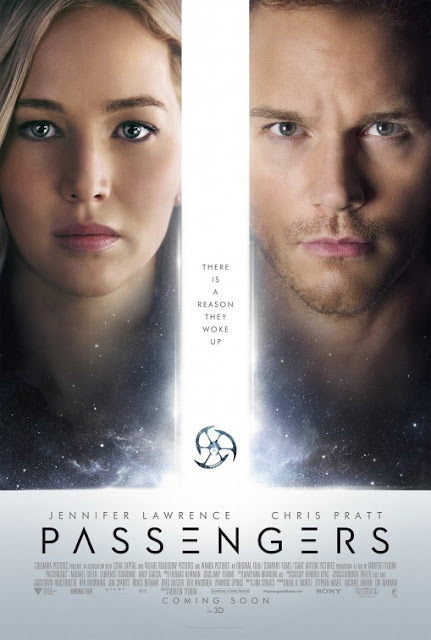 We had included the year to the title of this post because apparently there was already another, less memorable "Passengers" movie, starring Anne Hathaway and Patrick Wilson. Bound for the newly discovered planet of Homestead II on the Avalon, looking for a way to start a new life anywhere else besides on Earth, mechanical engineer Jim Preston, played by Pratt (Guardians of the Galaxy) awakens to discover that he has risen from his cryogenic slumber earlier than anticipated, due to a failure brought upon by an asteroid hitting the ship's core systems. Originally slated to sleep for about one-hundred and twenty years, he is awaken with ninety years to go on their journey. 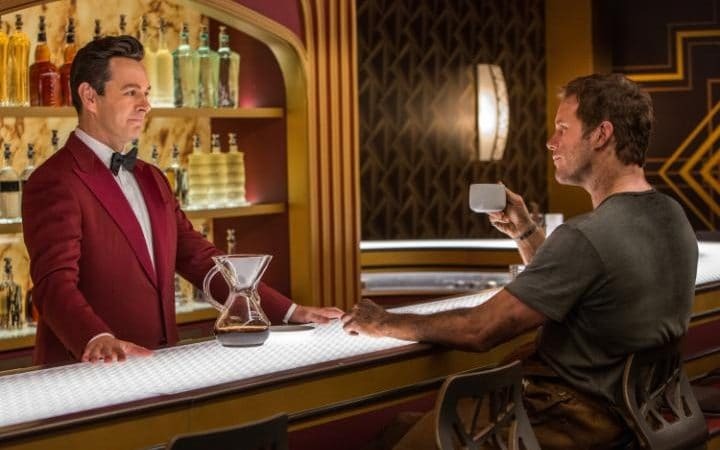 At the advice of his only remaining companion, an android bartender named Arthur, played by Sheen (Tron: Legacy), Jim made use of one full year to enjoy the vast luxuries the Avalon has to offer, but none of the amenities were enough to keep him distracted from the fact that he is alone. Eventually, he stumbles upon another passenger on-board the Avalon, a writer, Aurora Lane, played by Lawrence (X-Men: Apocalypse), and Jim eventually fall in love with the beautiful writer. Unknown to either of them, the ship's malfunctions done by the asteroid are far more critical than they thought. As the errors progress from mild to severe, the two, with the assistance of ship officer Chief Gus Mancuso, played by Fishburne (Batman v. Superman: Dawn of Justice), they must save everyone else on the Avalon before time runs out for all of them. Jennifer Lawrence is quite a very talented actress, as proven in her widely recognizable and highly popular performances in The Hunger Games film franchise as Katniss Everdeen, and in the X-Men movie series as Raven Darkholme, also known as Mystique. Through her wide variety of roles, she often portrays the characteristically powerful female lead to great effect. Here, Lawrence adds her usual charm to Aurora Lane, a writer forced to live with the fact that she might inevitably die ninety years earlier than expected. Combined with an intense level of energy that appropriately reflects the character's internal struggles brought upon by her unexpected romantic link to Jim, and eventually the shocking revelation that Jim himself is hiding from her, which I would later discuss in further detail by the third section, as well as her undeniable chemistry with her co-star Chris Pratt, Lawrence delivers yet another emotionally-driven performance, which can be seen in the part wherein Aurora listens to a heartbreaking message sent by one of her once best friends, Celeste, played by Aurora (Har-dee-har-har) Perrineau (Jem and the Holograms). This next comment is not really a point of criticism, but more of a snarky observation, and definitely not as an offense to Lawrence. I am pretty sure that Lawrence could take a chill pill, since all of her roles so far require her to yell. I am not joking. Have you seen some of her movies? Oh Chris Pratt, was there ever a time where in your on-screen charisma has never worked before? While in almost all of his film roles have him play as the quirky, hyper energetic, and overall fun main protagonist with a witty sense of adventure, there is no denying that Pratt is perfect to play that role, no matter what movie he is in. Once again, he is able to easily embody that usual character type that we all know and love to watch, but the main difference is that this time, his character carries a questionable moral compass, with the rationale again being discussed later because all of the most valuable and biggest spoilers are best left for later parts. By adding enough of his funny side to a strangely unfamiliar dash of tragedy, isolation and depression, Pratt managed to bring Jim Preston to life, most notably in the scenes wherein Jim is still adjusting to his newly encountered environments, alone. Get past that bizarre revelation, and you will soon realize that his problems are pretty much realistic, and it clearly reflects the lonely atmosphere that those who bare the same feelings as Jim would experience, resulting in a large series of morality questions being raised, and making Jim a very human (who is capable of somewhat inhumane actions, however) character. Michael Sheen, for all of his notable performances, somehow keeps on getting a lot of sub-par movies. Films like Tron: Legacy, Alice in Wonderland, The Twilight Saga and this one usually managed to squander his acting gifts, and speaking of Tron: Legacy, this might be his second science fiction movie with a mediocre outcome, yet with a nearly flawless visual canvas, that he is involved in. Similar to our first two aforementioned flicks, Sheen shines as an overly eccentric persona with a specific shade of mystery, and while Arthur does not carry that much wrappings of secrets outside of being one of the only few interactive robotic beings in the star ship that acts as a bartender, Sheen easily portrays Arthur full of odd wit and personality in a fairly minimal screen time. And here we come to our last main cast member, who does not even appear for more than half of the movie, as the movie suddenly decided to embrace the tone of a thriller, and seemingly discarding the romantic atmosphere that was originally felt. Come on guys, this is just a poor waste of a talented gentleman such as Laurence Fishburne. For Fishburne's role as Chief Gas Mancuso, a random officer in the Avalon who appeared out of nowhere in the movie, unfortunately did not add that much else to the flick, which is seriously just a huge shame. He did his best though. I have got to hand it to the crew though. Despite the fact that the movie is plagued with countless of problems story-wise, I simply cannot deny that the overall designs of the Avalon and other elements in the flick, as well as the special effects applied, are simply out of this world! About the designs, just take a look at the various scenes featuring the large assortment of amenities the Avalon has to offer. Every detail that lies within the ship, from its holographic devices, to its interior features, they are all very neat to look at, breathtaking to say the least. Nothing else would ever give you a good old futuristic vibe than a couple of properly designed and well-made sets. After all, that is what a good science-fiction story is suppose to do to any viewer of all ages and both genders. The specific scene that proves my claim right would have to be that part wherein the Avalon's gravity systems are malfunctioning, and sends Aurora on an anti-gravity swimming session! It is as fun and weird as I typed it. We see Aurora struggle to escape the floating masses of water, one of which is where she is trapped in, and we really cannot help but hold our breaths. Thomas Newman's score is probably the best thing about the movie. It is catchy, and it really reflects the sci-fi tone that the movie is aiming for. In case it is not obvious yet, spoiler alert! You can easily compare this flick to the usual burgers your local fast food establishment serves on a daily basis. On the advertising materials, it is warm with the colors of promise and innovation, but upon receiving it, it is shallow or incomplete, and probably at worst, terrible. One point of criticism that most other reviewers find appalling, which I agree in some part, would have to be the central conflict of the movie, which is Jim, desperate for having another human by his side after living for one year without any human companion, secretly waking Aurora up, costing her a better life in Homestead II, so that Jim would not be lonely. 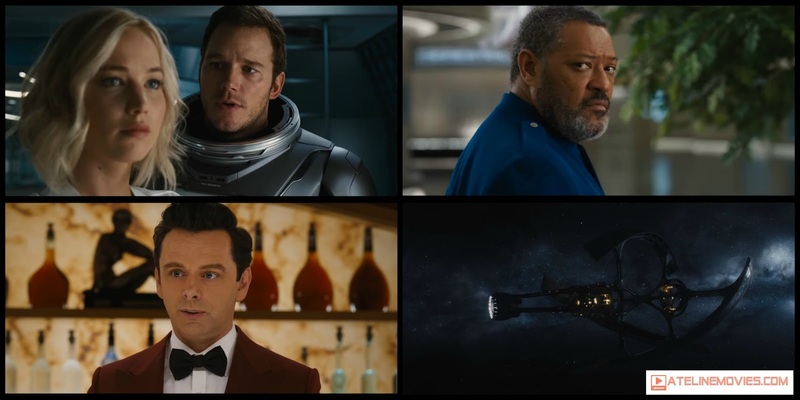 For the most part, I am actually much more disappointed because, as seen in the trailers, the movie is supposed to be more about a love story in outer space with a mystery to keep things entertaining, and not some bizarre story about creepy infatuation. Although, this is a very realistic case of moral dilemma that tackles the theme of isolation, proving that no man is indeed an island, but the fact that Aurora still fell in love with Jim, regardless of the consequences, makes the overall story seem questionable. But then again, we could just say that Aurora is just a nice woman, who just sees Jim for who he really is. I will be straight though, because the story has some interesting concepts to go through. The idea of having two passengers waking-up many years prior to their due date, and fall in love, in outer space is pretty interesting, if only the movie was more of a mystery or horror story, something that is on the same level of thrilling as the original Alien movie, than a romantic adventure. I think it would have been much better if both Jim and Aurora woke-up instead at the same time, and the two potential lovers, with Mancuso, race to find the malfunction before everyone on-board the Avalon dies. Now that is how you make a good movie. There are some noticeable elements of satire here, most of them directed towards the probable future of corporate science. Simple as they may be, they are undeniably funny and one of the film's most thought-of aspects. Some of these scenes that feature this claim include Jim's attempt to seek some help from Earth via a futuristic form of communication, only to realize that it will take approximately a long time for the message to be received, and Jim experiencing real world problems when he cannot get the type of coffee that he wants. As we have mentioned on and on, the falling action is where the movie really takes on a huge nose dive, which is pretty ironic considering that this part of the flick is called a "falling action". From this point forward, the movie completely ditches almost entirely the supposed blooming romance between Jim and Aurora, as only now, after two years, did these two finally decided to investigate the malfunctions in the ship. After Laurence Fishburne's Chief Gus Mancuso dying after catching more than a total of six-hundred ailments, which is sort-of funny when you consider the thought that Mancuso is only included here to keep the story going, and not much else, the two race against the time to remove the meteor that managed to crash into the Avalon's power reactor, with the systems ready to blow everyone on-board straight to kingdom come. As expected, Jim and Aurora save the day, but not before Jim temporarily dies after experiencing several injuries, but thanks to a nearby Auto-Doc, which sounds strangely familiar to an item from the Fallout video game series, because it is, Jim is okay. And, as expected again, their romance continues. Aurora is now totally okay with living with Jim for the rest of her life, which is nice and all, but it still feels kind of weird. Overall, the movie initially had a pretty consistent tone before, but by the time Laurence Fishburne enters the stage, it was a clear sign that the movie is fatally flawed, and it was a shame, really, given that the movie had plenty of things that could make this instantly into a huge success. Also, I almost forgot, Andy Garcia is here, for only five seconds of starring. Why did he even join here again? The movie fails to utilize Chris Pratt and Jennifer Lawrence's trademark charms, and its state-of-the-art production values, and audiences are treated to a tonally mixed and unfocused, although a visually appealing one, passable flick. 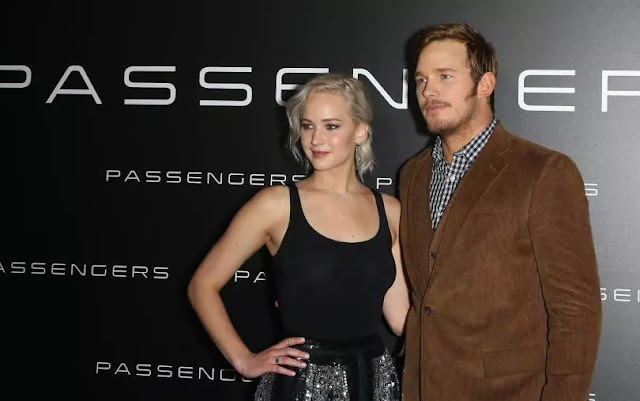 Although it tries to be a story about love with a science-fiction backdrop with the aid of two spectacular leads and amazing designs, Passengers fails to take flight with its third act tone shift and an outright confused plotline. While it was still entertaining in its own right, the movie was more of a letdown for me, and it did not meet a lot of my expectations. The funny thing is that before watching the movie, I actually said once to a person that the reason why she means something to me is because she saved me. When I coincidentally heard the almost exact same thing in the movie, all I do now is cringe and refuse to say it the same way again. And with that, we conclude our review of Passengers, which is our second consistent review of a Chris Pratt movie, with the first one being Guardians of the Galaxy Vol. 2. Since this sci-fi movie was disappointing, here is a preview of a potentially much better flick that would keep us sci-fi fans hoping for more better films. Stay tuned for more Dateline Movies!